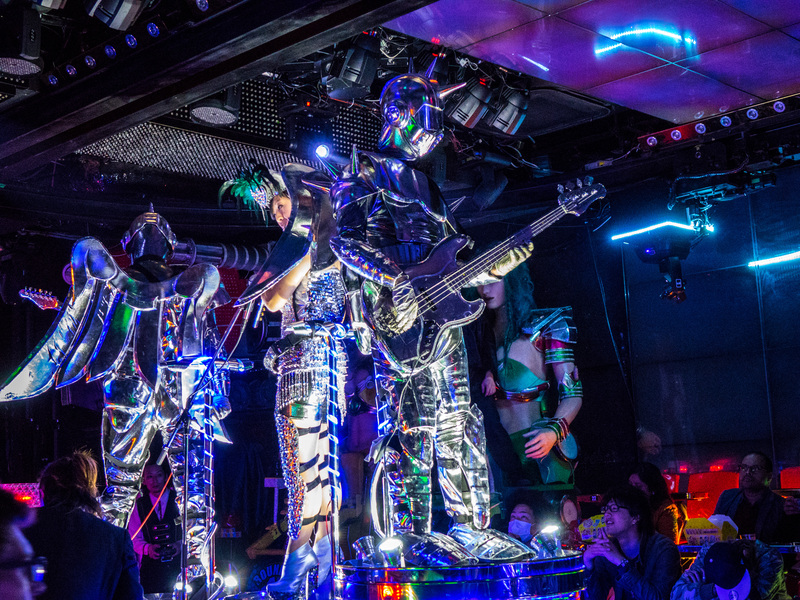 After the near religious of experience of Midori Sushi, now it was time for… something completely different – Robot Restaurant. Kind of speaks for itself no? Oh hell no! 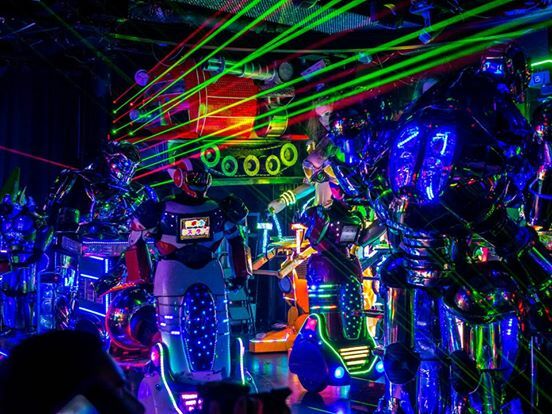 Even the clips I had seen on Anthony Bourdain’s show and the blog articles I had read did not, nay could not, prepare Chris and I for the awesome power that is Robot Restaurant. 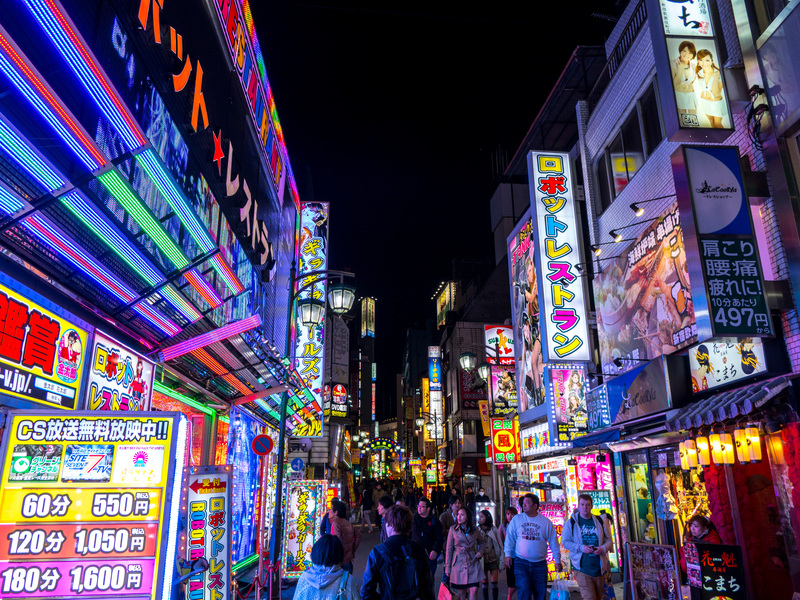 Even the walk towards it was surreal enough as we made the short walk through Kabukicho. This was a mere block away from our hotel and yet it was our first time walking into the heart of this infamous part of Shinjuku. We soon arrived at the entrance, which featured a woman riding around on a robot that looked like a giant woman, a terrible rock band dressed in robot gear and a bunch of confused tourists trying to make sense of it all. We were then escorted to a waiting lounge as they finished preparing for the show. The decor would have made Liberace blush but at least the chairs were comfortable. Another unique aspect of this room was the mechanical baby dinosaur that was walking around on our table, with instructions on how to pet and play with it. After that impressive intro, there was a short break while they got the next segment together where a woman playing a flute was wheeled in with a robot backing band. The video monitors that lined the walls started a story that had something to do with robots attacking a Japanese island from long ago… I think. This involved first a group of native islanders in masks being defeated by robots and then Amazon warrior like princesses trying the same thing. Both attempts sadly failed but then suddenly what appeared to be a rip off the Kung Fu Panda heroes burst through the gates on a giant animatronic cow – yes, I’m serious. They too were vanquished so the gods of the sea summoned a giant shark, which was moving its jaws as it charged towards the robots. The Big Bad of the robots was soon in its jaws and as the shark chomped down on it, firecrackers went off in its mouth to indicate the robot had been killed. Yes, it was as awesome as it sounds but Chris and I were laughing too much to get any photographic or video evidence. However, I found someone else’s clip on YouTube that basically captures it. After another break with flute girl and her robot band, the girls of Robot Restaurant came back to theme from Dreamgirls, some with drums, some with cymbals and two on stripper poles that had giant robot legs to move them around the floor. It only got stranger from there. Behold, robots dancing to Gangman Style! For the grand finale, the girls came back along with these 3 massive robots and a few other odd thing all crammed on the floor. They had given us glowsticks and the leader of the dance troop in rapid Japanese and broken English implored us to wave them around like we just didn’t care. 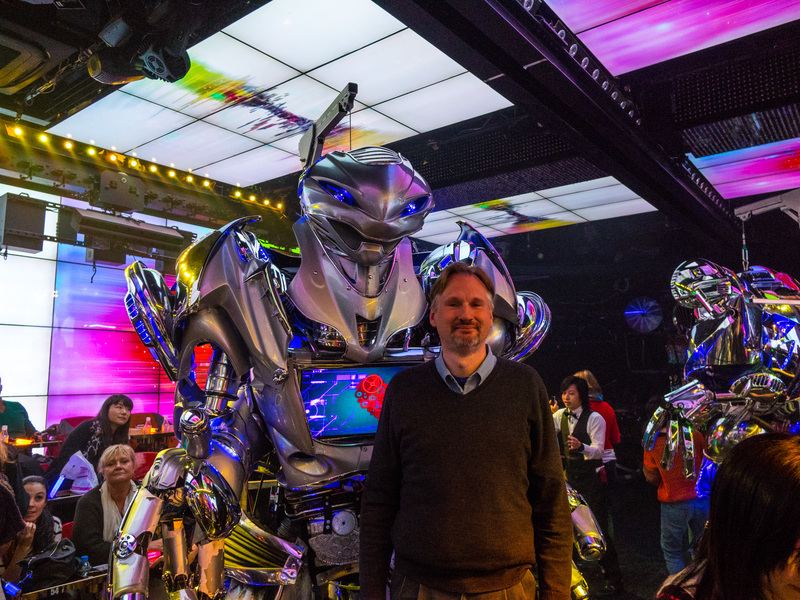 Still trying to process what in the Hell we had just witnessed, they turned on the house lights and told us we could take a picture with one of the 3 giant robots. When in Kabuchiko…. As we staggered out along with the other stunned patrons, we all realized we had just witnessed the most unique show we’ll probably ever attend. And we loved every second of it. Posted on April 7, 2014 by reyalto. Bookmark the permalink.